Every morning Liverpool Football Club trained in the wind. Liverpool Football Club played in the wind. And Liverpool Football Club beat Arsenal Football Club in the wind. Every morning Liverpool Football Club trained in the rain. Liverpool Football Club played in the rain. And Liverpool Football Club beat Leyton Orient Football Club in the rain. Every morning Liverpool Football Club trained in the mud. Liverpool Football Club played in the mud. And Liverpool Football Club beat Birmingham City Football Club in the mud. James came to my house to talk about what we could do about it. I had the manuscript on the desk in front of me, and as a joke I said to James, ‘Well, maybe we could cut out a few small words.’ I meant it entirely as a joke. But I started going through a manuscript page and cut out about a dozen words on the page. James said, ‘Give me that.’ I gave him the page. And he just kept cutting. He was cutting and cutting and cutting. When he was done with the page, it looked like a redacted piece from the CIA. I said, ‘James, how would they be able to read this?’ He said, ‘Let me read you the page.’ It was terrific. He said, ‘I know what I have to do.’ He took the whole manuscript back and cut hundreds of pages from the book and developed the style. That editor never knew what we had to do, but she forced him into creating this special Ellroy style, which his reputation as a stylist is really based on. It came from her, sight unseen, saying ‘Cut 25 percent of the book.’ He wound up cutting enough without cutting a single scene from that book. He saw Fed cars. He saw Fed surveillance. Feds perched down the road. Feds watched the meets. Feds checked licence plates. Local Feds – non-FBI – Dwight Holly’s boys. Wayne Senior was distracted. Wayne Senior was tract-obsessed. Wayne Senior missed the heat. Wayne Senior talked. Wayne Senior torqued Wayne. Wayne Senior worked to impress. Does this look at all familiar to the quote from Red or Dead? 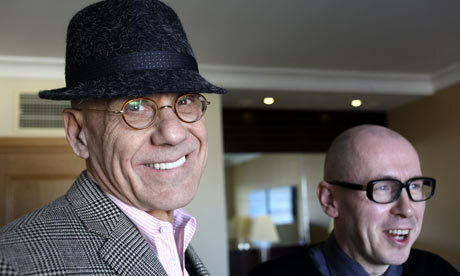 Sure, there is the lack of adverbs, adjectives and conjunctions which is a hallmark of Ellroy’s style but by refusing to allow any modifications to the sentence, he dooms the book to a dreary repetition, just as Peace has done with his latest work. Incidentally, The Cold Six Thousand is also around the 700 page mark, so we have an idea where this style takes us in terms of length. I know fellow Ellroy fans who gave up reading the novel halfway through. I have read it twice now, and I like it, but that’s because it covers five years of fascinating American history from 1963 to 1968. The story is strong enough to forgive the stylistic indulgences and there are moments in the novel where the style actually helps the action come alive. Still, it’s a grueling read and Ellroy has practically disowned it in some interviews. In his latest novel, Blood’s a Rover (2009), he returned to a more engaging style. Many fans breathed a sigh of relief, perhaps Peace should do the same. Even football fans would admit that the game can be boring at times, but its easier to forgive occasional stretches of boredom in a ninety minute football game than it is in a pretentious magnum opus about the sport. Besides, a boring game might come alive suddenly, Peace seems to have to a style too rigid for that to happen. And so Iain sighed. Iain closed the book. Iain lifted the book above his head. Iain brought the book down on his head with as much force as he could muster. Iain slipped into the sweet, sweet embrace of unconsciousness.